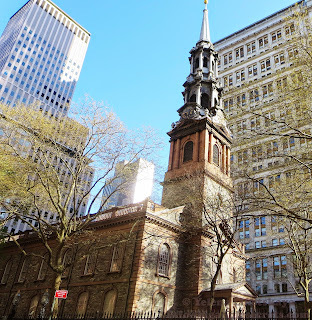 St. Paul's chapel is the only surviving church in New York of the Revolutionary era. It is also the oldest public building in continuous use in Manhattan. 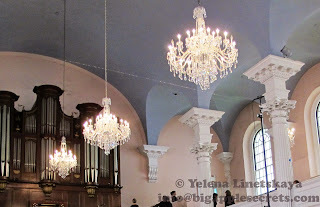 St. Paul's chapel was completed in 1766 on what was then the northern edge of the city. The giant old sycamore tree grew strong in the northwest corner of the church cemetery. For 150 years, it sheltered the chapel and the graves of Revolutionary War heroes and patriots buried there over two hundred years ago. On Sept. 11 more than 2 billion pounds of steel came crashing to the ground. The crash was so powerful it registered on the Richter scale. The chapel was less that hundred feet from tower Seven of the World Trade Center . It wasn’t until Sept. 14 that anyone was able to inspect what was left of St. Paul’s. Miraculously, where workers expected to see a pile of rubble, they instead found a completely intact chapel. Not a window had been broken (one was cracked). Not an inch of the walls or the roof had been compromised. 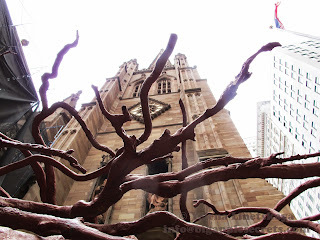 The sycamore saved the church. The tree was crushed by a huge steel beam blown from the tower. Inside St. Paul's Chapel, from the arched ceiling, fourteen colonial crystal chandeliers swayed but did not fall. In the weeks that followed. St. Paul’s became a place of worship and a place of rest for those who worked tirelessly at the epicenter of the tragedy. Later the sycamore tree succumbed to the extensive damage from falling debris and was cut down. 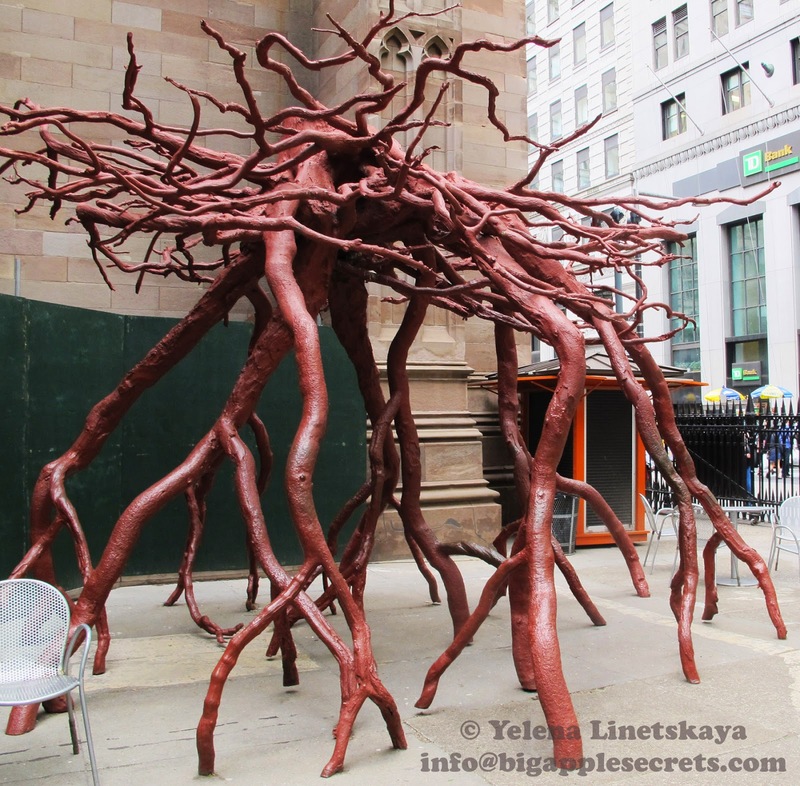 Its roots and stump remained at St. Paul’s until Steve Tobin was commissioned to excavate and reproduce the root in bronze. Steve Tobin was born in 1957 in Philadelphia, Pennsylvania. He studied theoretical mathematics and worked in Bucks County, Pennsylvania. In 1989 he became the first foreigner invited to build his own glass studio in Murano, Italy and in 1994 built his first foundry, and began to cast bronze. Mr. Tobin paid for the entire project. He first considered trying to raise the money, he said, but decided that it would take too long. So he took out a home equity loan to pay for everything: bronze, foundry costs, salaries for 10 assistants, transportation for the stump. 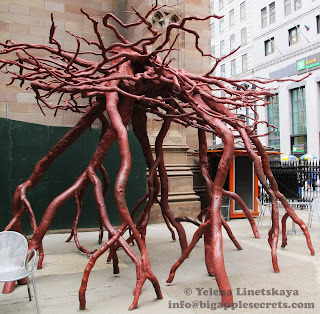 On September 11, 2005 a tree root, sculpted in bronze, was unveiled in honor of the fourth anniversary of 9/11. 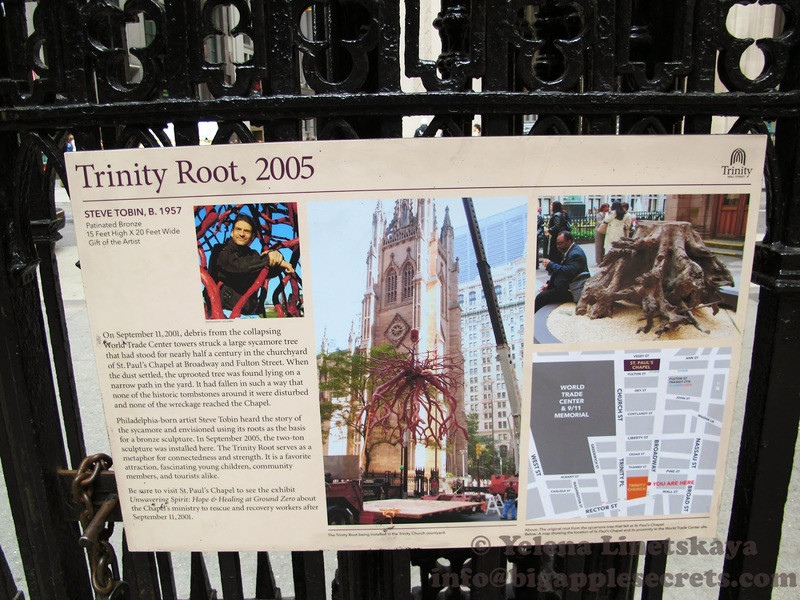 It took three days to transport the 6,000-pound bronze sculpture 70 miles from artist Steve Tobin's Pennsylvania foundry to the courtyard of the Trinity Church at Broadway and Wall St.
Daily News wrote : Tobin had the idea for the piece after visiting Ground Zero in 2001. Shortly after, his assistant Kathleen Rogers began to appeal to St. Paul's for its cooperation. 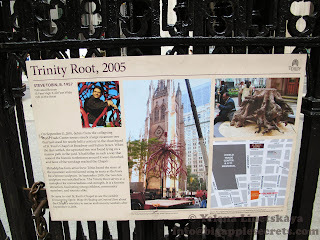 But the church wasn't then ready to hear ideas for artistic creations as it was still acting as a relief ministry, providing food and a place to sleep for 9/11 recovery workers. Since they got the go-ahead in June 2004, Tobin and his team of 16 have collectively spent more than 20,000 man-hours on the 300 separate bronze pieces that fit together to form an exact replica of the root structure, which, Tobin claims, is more hours than Michelangelo spent decorating the Sistine Chapel. 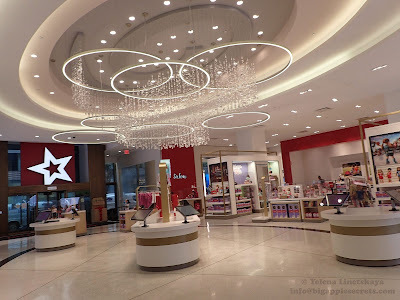 Tobin admires Michelangelo and other masters for their tremendous effort to create art."